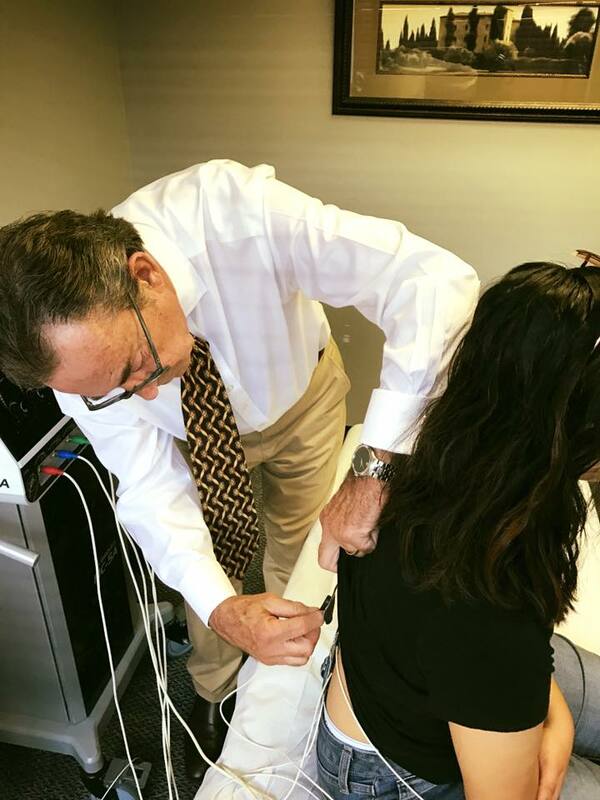 In 2010, as I obtained the professional training to use the Calmare MC-5A device, I grew more excited about using technology to deliver pain relief to my patients without the need for any prescription drugs. Nine years later, I’d like to offer an update about the progress we have made helping people reduce or even eliminate treatment- and medication-resistant chronic pain. Those of us who work in pain management were not surprised to see the eventual explosion of the opioid crisis. My healthcare specialty as a doctor of chiropractic requires using drug-free techniques to minimize and eliminate pain. Calmare scrambler is a remarkable pain management therapy for several reasons, including the fact that it can be used to combat several types of chronic nerve pain (neuropathy), including chemotherapy treatments (CIPN), Shingles (PHN), diabetes, post-surgical pain and unexplained nerve pain. What I did not foresee was the vast community of CRPS sufferers who had tried a myriad of medications, painful procedures, surgeries, treatments– and were still left with debilitating pain. After treating more than 1,000 patients, over the past nine years, it is apparent to me that CRPS /RSD is a unique communication between local skin tissue and the pain center of the brain. The Calmare MC-5A device scrambles this misfiring pain message/signal–which says there is pain—when, in fact, there is not. After the technology scrambles this misfiring message over a series of daily treatments for a period of two weeks, in most cases, the brain’s misfiring message ceases and pain is eliminated. Using several small electrodes (think EKG) carefully placed in the region of the injury, the technology sends a mild and painless “no pain” message to the brain through the electrodes. Keep in mind, the brain can send this faulty pain message to any region of the body—even a location which never sustained any kind of injury. There is, in fact, no physiological reason for the pain. As a comparison, phantom limb pain can result when a person who has undergone an amputation still feels significant pain in the part of the body which has been amputated. Calmare is a ‘Provider-Dependent’ pain therapy. and measurable success treatment your type of neuropathy. “TENS (a self-administered tens unit) is thought to work through the gateway theory of temporary pain relief, whereby normal touch sensations blocks pain sensations. Dr. Loprinzi said that through a process called ‘plasticity,’ the brain is ‘retrained’ and will no longer register a pain sensation in the affected area. To date, there are at least 20 published reports on scrambler therapy that included results involving close to 1,000 patients in total. These reports include clinical practice summaries, prospective non-randomized clinical trials and randomized controlled trials, including two trials that sought to double-blind patients and investigators. For 17 long years, Peter tried every medication and every treatment, including a spinal cord stimulator (neuromodulation or SCS) to lessen his chronic pain. Still, his pain level hovered around a consistent 7-8 on the Pain Scale. After the completion of the standard 10-treatment therapy, we both teared up when he realized he was pain-free for the first time in more than a decade. Peter and his long-time partner co-wrote a book detailing his Calmare Therapy treatment experience. Young teenager Cara from the UK underwent several therapies and pain management medications to lessen her neuropathy. She was still left in pain throughout much of her body. 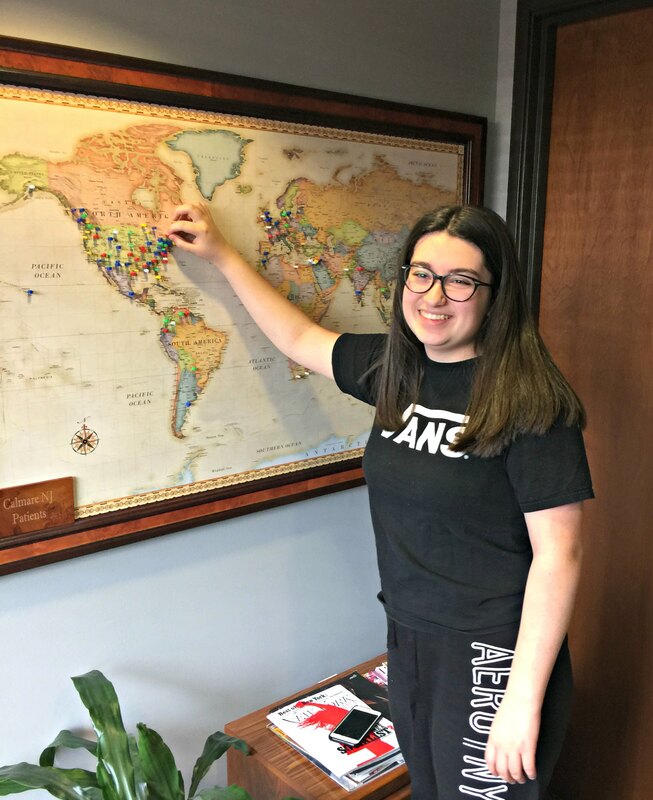 Ultimately, her family elected to seek an alternative medicine solution and chose to cross the pond to the U.S. so that Cara could be treated by our Calmare New Jersey team. I’m delighted to report she sustained a terrific outcome. Best of all, she left smiling with her pain level down to a 1/10. “When my pain management doctor told me a spinal cord stimulator (SCS) was the final treatment option, I knew I had to take matters into my own hands and reach out to the chronic pain community for a less invasive option,” Tonya explains. After her routine hand and wrist surgery, the chronic pain started in one hand and soon spread to the other. As the condition worsened, the chronic nerve pain spread to her neck, back and stomach. You can read or watch more of our patient stories, most of whom arrived at our clinic bearing the weight of daily pain that made work, school–even socializing or taking a walk in the park–impossible. They courageously tried invasive pain relief procedures and side-effect-laden painkillers and opioids without success, up to the day they arrived at our clinic. Not surprisingly, many new patients arrive at our clinic skeptical and dejected. But they all had one key attribute that remained steadfast–regardless of all the treatment disappointments. And we were honored that they mustered the remarkable fortitude to try (one more time) to mitigate their pain and regain their quality of life. Eight years after introducing scrambler therapy to our clinic, I have treated children, teens, parents, and grandparents, most of whom are living pain levels from 8-10 every day. In 2019, Calmare is now the only pain relief therapy we offer here in our NJ clinic. After 10 daily treatment sessions, lasting about 35-minutes each, more than seven in 10 patients achieve a pain-free state or a reduction in pain to the degree that enables them to resume a pleasurable quality of life. Why do 30 percent not achieve pain relief? Sometimes they have additional health issues which interfere with treatment, sometimes they are non-compliant after therapy, and sometimes we just don’t know why Calmare did not lessen their pain, unfortunately. In this era of failed opioid pain relief and increasing difficulty obtaining medication for chronic pain, people in pain are seeking drug-free options to lessen pain. Nine years since first introducing Calmare scrambler therapy, I have never felt more assured that this treatment can dramatically elevate the quality of life for people living with chronic pain. Dr. Michael Cooney is one of seven certified Calmare providers in the U.S. His clinic is located just outside New York City. He is a professionally certified chiropractor who has been treating severe acute and chronic pain conditions for more than 35 years. After introducing Calmare Therapy in 2011, he soon began helping people with treatment-resistant neuropathy from as far away as South America, South Africa, Australia and Europe. Dr. Cooney offers complimentary phone or video chat consultations with people from outside the U.S. To learn more, visit www.calmaretherapynj.com email info@calmaretherapynj.com or call 201.933.4440. Leave it to the teenagers to discover Calmare scrambler therapy on YouTube! Since we launched scrambler therapy here in New Jersey in 2011, we have used YouTube to share patient case studies with a broader audience seeking drug-free, alternative treatments for chronic nerve pain. Today, we have nearly 50 patient outcomes on our channel and nearly 100 more featured on our blog-based website. Emma from Montreal is a 16-year-old suffering from CRPS as a result of a fall from a bicycle. After battling intensifying pain in her right and then left leg for the past year, her neuropathy eventually prohibited her from attending high school and seeing friends regularly. She had undergone pain management injections and even reported to Ketamine to help lessen her pain. She searched “CRPS” on YouTube one day, hoping to discover other young people like her who were socially isolated because of the condition. Emma and her parents arrived here in Rutherford on February 25, 2019; her pain level hovered around 7.5/10. Steadily, each day, she underwent her scrambler therapy treatment and most days, her pain level decreased. On the tenth and final day of therapy, she left with a 2/10 pain level, which had been sustained for a few days. Emma is obviously elated that she finally discovered a treatment to reduce her CRPS pain. The pain is down to a 1 in both legs and she said that sometimes she feels no pain all. This truly is a life changer for Emma and we can’t thank you enough. To learn more, call our friendly team to discuss your chronic pain condition at (201) 933-4440 or email us privately at info@calmaretherapynj.com. This week we welcomed 54-year-old Abraham back from Kiryat Ye’arim, Israel who first treated with us in 2015 and again 2017 for booster treatments to reduce his post-surgical neuropathy. He returned this week for four booster treatments and added his pin to Israel on our Calmare patient map. We are always amazed to discover how people with chronic pain discover us from around the world. Abraham, first heard about Calmare scrambler therapy in 2015 after watching a promising story about scrambler therapy featured on the Charles Osgood File Report. 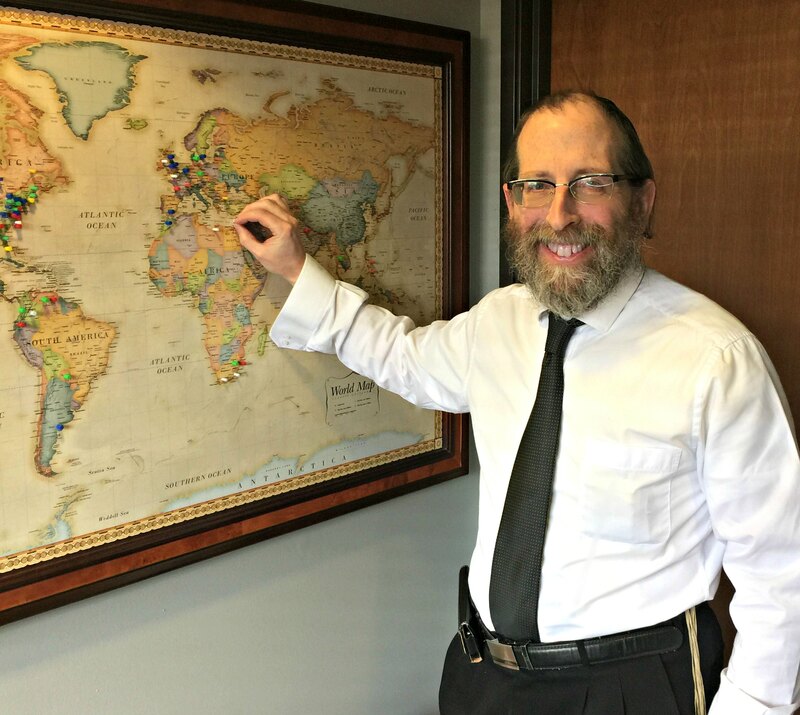 Abe, a rabbi who works in publishing, makes the long trip from Israel to our clinic in New Jersey to reduce or eliminate his chronic nerve pain, when the pain returns and begins to increase. Some of our patients never require further treatment (Calmare booster therapy) while others with more severe conditions, or who suffered with treatment-resistant neuropathy for a year or more, may need occasional treatments, if the pain returns. As I’ve said before, in many cases, the need for boosters is generally less frequent as time goes on and fewer sessions are required. If you have been unsuccessful lessening or eliminating post-surgical neuropathy or other types of chronic nerve pain, I would be happy to discuss your case during a no-fee phone or video consultation. Note that you should be in a position to travel to New Jersey, USA and lodge in the New York City/New Jersey area for a period of two weeks, should we mutually agree you are a viable candidate for this FDA-cleared pain management therapy. To confirm a phone consultation, we invite you to email us at info@calmaretherapynj.com, call the clinic at 201.933.4440 or complete the card below and we’ll reach out to you within 72 hours. As some of you know, we are now helping people with treatment-resistant chronic back pain and sciatica. This is especially useful for seniors who have already tried other traditional therapies and medications but did not achieve relief. Rina’s chronic sciatica pain grew progressively worse as she tried medications and other therapies, including alternative medicine, to lessen her back pain. In fact, she was verging on losing her ability to live independently while only in her early 70’s. A savvy user of the internet, she took matters into her own hands and discovered Dr. Cooney and his MC-5A Calmare scrambler therapy device in northern NJ. After completing a phone consultation with the doctor, where they discussed her current medication usage and previous therapy efforts, they mutually agreed that Calmare Therapy may be a viable therapy. To find out if your chronic back pain or sciatic condition may be suitable for Calmare therapy, contact us using the form below, email us privately at info@calmaretherapynj.com or call 201-933-4440 and Dr. Michael Cooney will speak with you directly about your chronic pain challenge. Last summer, high school football player Austin arrived at our clinic using a cane and could not put weight on his leg/foot. After surgery for a fractured fibula, he was soon diagnosed with CRPS which caused continued shooting pain; over time small treatment-resistant lesions began to develop on his affected foot (center image). His family had read about our success treating these lesions and resulting chronic nerve pain from complex regional pain syndrome (CRPS) using scrambler therapy. They flew with Austin from the Southwest for him to undergo treatment and he achieved both pain relief and the lesions on his foot were more than 50% healed after his 2-week treatment (image on right). Austin is doing wonderful. It has been a 180 since Calmare treatment, we are ever so grateful to you. Below is a video of him snowboarding!!!! Thank you again for all you do! After seven unsuccessful surgeries trying to lessen his post-surgical CRPS neuropathy, pain management doctors recommended Ketamine or a spinal cord stimulator to control his pain. Rob, a 42-year-old electrician from New Jersey, was living with a consistent 7/10 on the pain scale. With limited mobility, he was eventually unable to perform the work he loved. His pain management team ultimately recommended he undergo Ketamine infusions or have a spinal stimulator (SCS) implanted into his back to control his chronic pain. Calmare scrambler therapy has no side effects and is painless to undergo. It is cleared by the FDA in the USA. The Calmare® MC-5A device creates a low energy electrical impulse which travels through the patients nerves delivering a “no-pain” signal to the brain. This process “tricks” the brain that the area of pain is normal and eventually results in prolonged pain relief. This non-invasive technology has successfully treated thousands of patients in the U.S. and Europe, where the therapy has been shown to be effective in relieving and minimizing pain and physical symptoms as a result of several treatment-resistant neuropathic conditions. Chronic pain conditions which may be suitable for scrambler therapy. If you have a similar situation to Robm and living with medication and treatment-resistant nerve pain, Dr. Cooney would be happy to offer his assessment about the potential viability of Calmare Therapy in your case. Calmare is not right for everyone and Dr. Cooney will not perform the therapy on any patient unless he determines there is a high probability of pain relief success. Complete the Consultation Request Card below or call us directly at (201) 933-4440. Kudos to our patients who aren’t phased by the approaching snow event this week. Their nearby hotels will bring them to/from our clinic and we’ll keep the doors open to treat everyone, rest assured. We are increasingly welcoming more people battling nerve pain after chemotherapy treatment. (This neuropathy generally scoffs at traditional pain medication). Very, very uplifting for us to see these patients mobile and smiling again. The after-effects of chemo can be life-saving, most assuredly, but can later diminish the patient’s quality of life with resulting nerve pain. Studies show that as many as 50 percent of chemo patients suffer from CIPN, a tremendously painful condition that is famously difficult to treat with traditional medication, most commonly Cymbalta, Lyrica, or Gabapentin, and standard pain management strategies. with neuropathy as a result of chemotherapy,” says Dr. Michael Cooney. Calmare scrambler therapy to combat pain from CRPS and nerve pain after chemo. We welcome you to contact us to learn more about using scrambler therapy as a non-invasive, painless treatment for nerve pain after cancer treatment. Our clinical director and founder, Dr. Michael Cooney, speaks personally with any potential Calmare patient. Scrambler therapy is not right for everyone, and we will not recommend treatment unless Dr. Cooney determines there is a strong probability of pain relief for the patient. Calmare is non-invasive, has no side effects and is 100% drug-free. Fill out the info card below and we’ll reach out to you. Or, feel free to call the clinic at (201) 933-4440 and speak with our friendly and knowledgeable Calmare team. Calmare scrambler therapy is an exciting drug-free alternative to combat nerve damage as a result of medication and treatment-resistant sciatica or lumbar nerve damage. Please be advised that we have limited Calmare booster appointments available between Christmas and the New Year. As of this morning, we have the following dates available. To schedule an appointment or if you have an urgent need around these dates, please call us at (201) 933-4440. Most people who visit our website are already frustrated with the medical community. 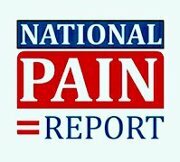 They or a loved one are in pain. Pain medication is not pain management, they have learned firsthand. But a myriad of painful procedures, surgery and implanted devices have also failed to do their jobs. From unexplained neuropathy after surgery to diabetic neuropathy or pain after chemotherapy , too many people are left with unresolved neuropathy. And they continue to lead debilitated lives, so unfairly. I came to this conclusion years ago, which is what compelled me to launch Calmare scrambler, an FDA-cleared alternative therapy here in New Jersey in 2011. It has no side effects, is painless to undergo. It’s drug-free. The worst case scenario is that the treatment does not work, which happens. But in more than 75% of the patients we treat, their pain is significantly reduced–or eliminated. From 10-year-old children to seniors who had battled neuropathy for decades, you will discover someone who has fought the same battle with pain that you do. Then, we hope you’ll reach out via the contact form below, by emailing us at calmarenj@gmail.com or calling our clinic at (201) 933-4440. Don’t give up. Keep fighting. The solution to your pain is close at hand. Emily Hewatt is a wonderful young woman who gained global attention in her quest to find a pain management solution for the CRPS she had been battling for four years. The pain and side effects of the disease had kept her inside, unable to enjoy a true quality of life. She had foot surgery in 2012 and the symptoms of CRPS began about a month after the operation. Her condition and pain region continued to expand from her lower extremities up the right side of her body. Due to extreme sensitivity in her foot and leg, she eventually required the support of a wheelchair full-time. In addition, she has not been able to wear shoes on her feet for years. After her successful pain management outcome with us in 2016, almost two years to the day, she left us pain-free and without the need of a wheelchair. The severity of her CRPS condition will require lifelong healthcare maintenance, which Emily recently shared and generously permitted us to share with you. It has been two years since I was so humbly blessed with tremendous generosity and support which allowed me to be further blessed by the caring hands of Dr. Cooney and his team. It was a very scary and daunting adventure traveling from our tiny town in North East Victoria, Australia halfway around the world to Rutherford, New Jersey, USA in search of a pain management treatment for my CRPS. My treatment outcome was life-changing, to say the least. I left New Jersey without any pain, without the need of a wheelchair. It was just unbelievable. For the first two weeks post treatment I did as I was told and did nothing but rest and recover. On the 15th day however, we had to execute a charity trail ride we had organized months earlier. After four years of excruciating pain forcing me bound within the walls of our home. It was my first full day out and walking! Until later that night when we got home and my body was on fire and I was back in my wheelchair just to get inside from the car, I could barely move. That was when I realized that even though I had felt amazing–with no pain since the Calmare treatment–that I still had CRPS and needed to manage it. So that has been the underlying theme of my life, to keep myself feeling as good as possible and as often as possible, and I’d say I am doing pretty well at it. This drove home for me how important, especially now, it was to take care of myself, which is how we eventually came across Calmare Therapy or scrambler therapy as we now know it as in Australia. My philosophy is do whatever you need to do to feel better. much—even after enduring four years of constant pain. I have learned how to live my life so when I do get pain and become symptomatic from time to time, it’s not a big deal. I have all the tools, like the scrambler therapy, and knowledge I need to manage it. The only one who truly knows me and knows what is right for me is me. So thank you, Dr. Cooney, and your team and everyone who has shared their generosity and support with me. Only I will ever truly know how much you all have given back to me. To learn more about treating chronic nerve pain using non-invasive scrambler therapy, call (201) 933.4440 or email us privately at calmarenj@gmail.com and we’ll respond within 48 hours of your call or message. I’ve been in the pain management field since Gerald Ford was president. Over the course of my career, I’ve seen countless pain management therapies and pain medications come and go. During all of those years, I’ve never seen patient outcomes come anywhere close to what we have achieved with Calmare scrambler therapy. Since we introduced “the scrambler” in 2011, we have watched children, teens, adults and seniors’ lives transformed by its uncanny ability to reduce or eliminate chronic pain (neuropathy). We have been able to help people who had already tried all the drugs, the invasive therapies, the painful procedures and the failed surgeries, without success. Never in my wildest dreams did I think people in pain would travel to us for treatment from Australia, South Africa, South America, Europe and Canada. Don’t get me wrong–scrambler therapy doesn’t work wonders for everyone, unfortunately. It is not a miracle treatment and you’ll never hear me say that it is. the pain reduction results have been life-changing. So starting today, we will be able to help more people, provide quicker service and offer a broader range of appointments. If you’re ready to try a newer way to fight pain, you’ve come to the right place. Here’s to winning the war on pain, one patient at a time. Donna Sisco, left, is shown with Dr. Michael Cooney and her sister Debbie. From traditional pain management and prescription medications to platelet-rich plasma (PRP) injections, from acupuncture to the use of a tens unit, nothing could reduce Donna Sisco’s chronic nerve pain after total knee replacement surgery in 2012. At age 61, she began to feel that hope was lost. But after finding an online support group for people living with CRPS, she heard about Calmare scrambler therapy and the success of Dr. Michael Cooney at Calmare Therapy NJ USA. With her sister along for support, the siblings flew 3,000 miles to New Jersey with equal amounts of hope and skepticism. Why Diagnostic BrainSpan™ is a key asset to your Calmare Therapy protocol. 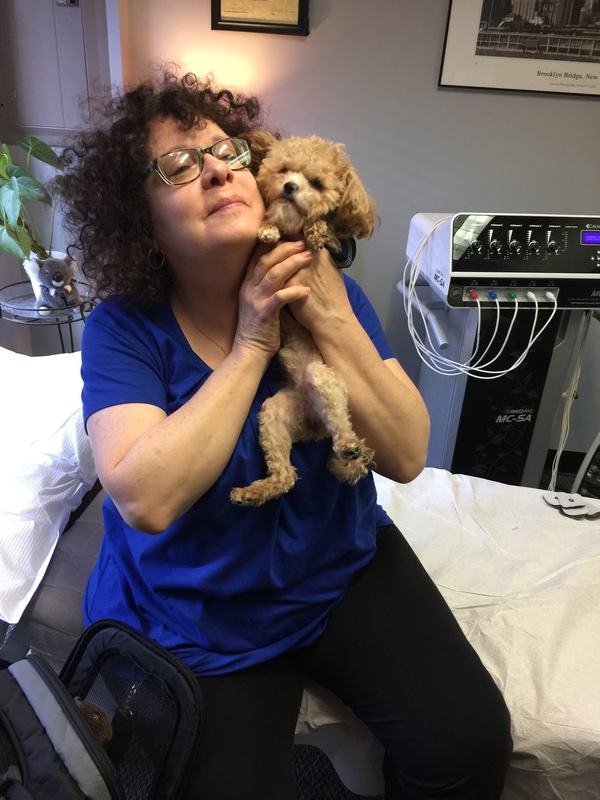 When Donna arrived in New Jersey, her pain level was a consistent 7/10 and she battled with the additional side effects of CRPS–pins and needles, sensitivity to touch, hair loss. Steadily each day, she had a scrambler therapy treatment, lasting about 35 minutes. The therapy has no side effects and is pain-free. After 10 scrambler therapy treatments (once daily), her pain level steadily decreased to a 0-2/10 by the time she left our clinic last week. To learn more about people like you who have undergone Calmare Therapy, watch and read their stories here. To find out if Calmare might be right for your chronic pain condition, call us at (201) 933-4440 or email us privately at CalmareNJ@gmail.com. We have been friendly partners with Victoria and her team from the UK who created and manage Burning Nights CRPS, a global resource for education, support and resources for people around the world battling complex regional pain syndrome. Since 2015, the web-based organization has published educational pieces about drug-free CRPS pain management options, including Calmare Scrambler therapy. This week, the highly-respected organization published Dr. Michael Cooney’s article “Fighting Back Against CRPS with Calmare Therapy,” which offers the doctor’s personal insight about why scrambler therapy has been so successful minimizing and even eliminating CRPS pain and physical symptoms. He also shares some recent patient success stories, including a teenager from Scotland. We hope you will visit Burning Nights, if you or a loved one is affected by complex regional pain syndrome to learn more, find support and discover valuable resources. If you can contribute to their charity, even a little bit, all the better. Meanwhile, we hope Dr. Cooney’s latest article, provides insightful information to parents in search of drug-free, non-invasive treatment to lessen or eliminate their child’s chronic nerve pain. Wishing you a low pain weekend! Would You Like to Talk with a Calmare Patient? If you are reading this article, you may have already tried countless pain management medications, therapies and painful procedures, all in an effort to tame the chronic pain monster. By the time most of our patients come to our clinic here in New Jersey, they have undergone all of these frustrating, heartbreaking and bank-account-draining experiences. One of the many ways we strive to go above and beyond for patients is to offer an exclusive program called Calmare Patient-2-Patient, where future patients can talk by phone, Skype or email with one of our previous patients who has volunteered to share their personal treatment experiences. We’ll also do our best to put you in touch with one of our patient volunteers who has the same or a similar medical challenge to yours. (Our patient volunteers are not compensated). The result? You can get firsthand information about what Calmare treatment is really like directly from other patients just like you! More than 75 percent of the patients we have treated are pain-free or have significantly reduced their pain levels. (Keep in mind, the majority of our P2P patient volunteers are not medical professionals and cannot offer any medical advice or opinions). in the United States (Dec. 2017). Call (201) 933-4440 or complete the Information Card (below) and we’ll put you in touch with our clinical director, Michael J. Cooney, DC, who will talk with you personally about your medical history, medication usage and other pain management therapies you have tried. If you mutually agree Calmare Therapy is a viable neuropathic pain treatment option, we’ll get to work connecting you with a P-2-P volunteer diagnosed with the same or a similar medical condition. (You can chat by email, text, Skype, FaceTime or phone). If you have questions, reach out to our respectful, patient and friendly Calmare team any time! Chronic pain conditions can disrupt daily routines and activities, especially in the summer. Hot weather can exacerbate pain symptoms, while changes to the household routine such as school breaks for the kids or family vacations can make wellness routines harder to maintain. Regardless of where you live, everyone looks forward to the summer months—the daily schedule is less hectic leaving more time to just enjoy yourself. Enjoying the summer months and hopefully making some new memories along the way requires planning for chronic pain sufferers. I start telling my patients in April that they should be thinking of warmer months ahead and plan accordingly. Self-care extends through all the seasons. Planning ahead for health-challenging roadblocks minimizes reliance on others, feeds your independence and keep you socially engaged. Depending on your pain condition, water can be a wonderful respite from pain and you can find a pool or lake without looking too hard. Make a point of accepting those pool party invitations and bring a cool drink into the water with you. Don’t swim? Many pools are only four to five feet deep, so no worries. While you are in the surf or lake or pool, do some light stretching (so one can see you under the water). Closer to home, a misting fan can be very relaxing and cold packs can be lifesavers during summer pain flares. Unfortunately, you may be living every day with burning nerve pain. The last thing you want to expose yourself to is sunburn or prolong heat exposure. Changes in temperature and barometric pressure can also trigger joint pain. Fortunately, many people who battle pain don’t also prefer to stay out of the heat, so it should not be hard to find some company. Plan activities in the early morning or after the sun begins to set and put a hand-held fan in your bag whenever you venture out. Wear loose clothing and comfortable shoes. Grab a light hat to shield your face, also. Summer activities always seem to include plenty of uncomfortable seating– tiny café chairs, bleachers at a ball game, outdoor concerts where you sit on the hard ground. Plan ahead—store a folding or travel chair that fits in the truck of your car. Add a couple of cushions to sit on or bolster your lower back. Fruits and vegetables are not going to be better than they are right now. Enjoy them and boost your vitamin and mineral bank as well. Increase the quality of your food. You will feel so much better for it. My favorite summer snack is the big red cherries you only see for a few weeks in the market. I eat far too many every year. The good news is that the USDA Agricultural Research Service found that cherries contain pain-fighting and inflammation-reducing compounds that can help lessen pain, particularly arthritis. During the summer, it is especially important to pay attention to the air quality ratings before heading outdoors. Studies have shown urban air pollution increases inflammation, particularly for people with fibromyalgia, chronic pain syndrome, and MS. Before heading outside, check the Air Quality Index (AQI) at your outdoor destination. 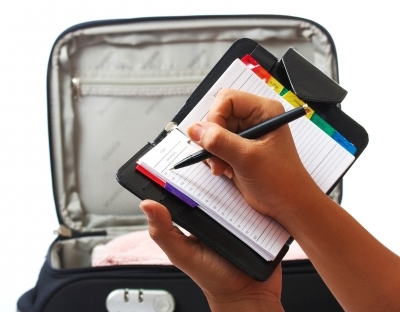 Don’t let summer vacations or road trips get in the way of your treatment plan. Check in with your doctor before you go. Let us know what your plans are and we’ll help navigate your adventure as painlessly as possible. Be as self-sufficient as you can by planning ahead this summer. This will lessen stress and increase your sense of independence. Learn more about Calmare Therapy, an alternative therapy for combatting treatment-resistant nerve pain. Dr. Michael Cooney is one of six U.S. certified providers of Calmare Scrambler Therapy. He can be reached at (201) 933-4440 or CalmareNJ@gmail.com. Since Calmare scrambler therapy was introduced in the United States, the Veteran’s Administration was one of the first healthcare organizations to purchase MC-5A devices and try the drug-free therapy to lessen several types of chronic pain. Today, Calmare is offered at several VA hospitals worldwide and is also a covered treatment, enabling veterans to obtain scrambler therapy at any provider, including Calmare Therapy NJ USA, (with a referral from a VA-affiliated doctor). This week, the Boston Globe published a terrific article highlighting that the VA is aggressively adopting alternative medicine alternatives to battle pain instead of opioids. While we were disappointed not to see Calmare featured (CPT Code 0278T), we were pleased to see recognition of the VA’s effort to treat neuropathy without opioids. Whether you are a veteran–or one of millions living with chronic pain because traditional pain management or prescription medications simply did not work for you–we hope you will reach out to learn more about our new pain management alternative. and there are no medications or invasive procedures required. Peruse our website, read our patient testimonials and reach out via email at calmarenj@gmail.com or call our New Jersey-based clinic at (201) 933-4440. Most importantly, do not give up hope. There is a cure for your pain. The Veteran’s Administration is now covering Calmare scrambler therapy treatments on its VA Fee Basis Program for any patient under the care of a VA physician, using the CPT code 0278T. All four branches of the U.S. Military have been successfully using scrambler therapy since 2011 and have steadily increased the number of MC-5A devices at its hospitals, including the Department of Veteran’s Affairs. To obtain medically-covered treatment from a Calmare provider, the patient must obtain a referral for scrambler therapy from a VA-affiliated hospital. “The U.S. Military was one of the first treatment centers to adopt Calmare to treat injured soldiers who did not respond to pain medication or traditional neuropathic pain treatment,” says Dr. Michael Cooney, clinical director of Calmare Therapy NJ USA. During training sessions for military healthcare personnel, the Calmare Therapy method of pain relief was highlighted as one of their most promising medical treatments. The FDA-cleared MC-5A scrambler therapy device was adopted by the U.S. Armed Forces in 2011 as an alternative to surgery or potentially addictive narcotics. The technology works by sending a “no-pain” signal through strategically-placed electrodes on the patient’s skin. These signals override the native pain message, reducing the pain intensity and often offering immediate relief. For maximum benefit and long-term alleviation of symptoms, multiple treatment sessions are often recommended, depending on the cause and severity of the pain. Today, the American military is one of the world’s largest providers of Calmare Therapy; the device is offered at medical centers in every branch of service. At Calmare Therapy NJ USA, our clinical director, Dr. Michael Cooney, is one of the world’s foremost experts on using the device to treat severe chronic pain in children, teens, adults and seniors. If you are a patient at a VA hospital and have been prescribed Calmare scrambler therapy for pain management, contact our highly experienced team, located 10 minutes from New York City, 20 minutes from Newark Airport and about two hours from Philadelphia by calling (201) 933-4440. Calmare scrambler therapy is a drug-free, non-invasive, FDA-cleared therapy that painlessly scrambles a misfiring pain message from the brain, suggesting there is pain, when, in fact, there is not. To document the viability of using scrambler therapy as a pain management solution to significantly reduce or eliminate neuropathic pain in patients diagnosed with Fibromyalgia. After a personal consultation and evaluation by Dr. Michael Cooney, selected trial candidates will undergo 3 to 5 treatments, once daily, lasting approximately 35 minutes. Additional treatments will be at the discretion of the clinical director. 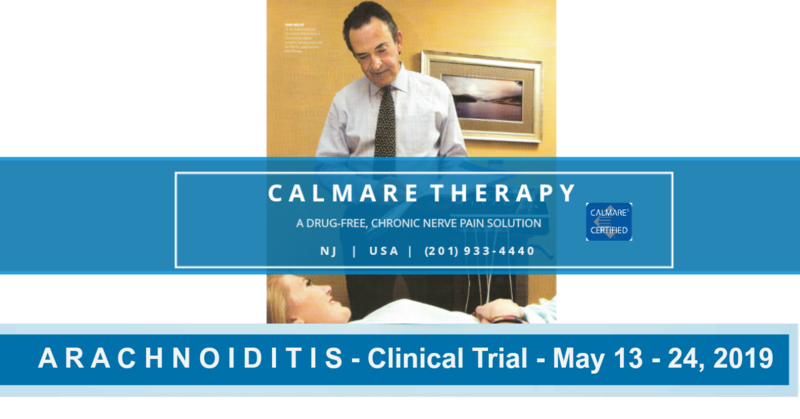 Calmare Therapy NJ / Rutherford Allied Medical Group, is one of only eight certified providers of Calmare Pain Therapy Treatment®, an FDA-cleared, non-invasive, pain-free, drug-free technology to treat patients suffering from several types of long-term, high-intensity pain. We are conducting a no-cost, 3 or more treatments (one 35-minute daily therapy session) clinical trial study for pre-qualified patients suffering from diagnosed fibromyalgia FMS to determine the efficacy of scrambler therapy as a viable treatment solution for condition-induced neuropathy. Selected clinical trial volunteers must be available to undergo the protocol once per day. We will make every effort to schedule daily appointments at a convenient time for participants. Travel, daily transportation, meals and accommodations are at the trial participant’s expense. We are seeking trial candidates with few or no additional medical conditions, in order to maximize the treatment and outcome of the FMS condition exclusively. Clinical trial volunteers who are selected for the study are asked to sign the Informed Consent Form. Signing this document does not require participants to remain for the duration of the study, however. People can leave the study at any time—either before the study starts or at any time during the study or the follow-up period. The informed consent process continues throughout the study. If new benefits, risks, or side effects are discovered during the study, the researchers must inform the participants. Calmare Therapy NJ reserves the right to publish data about any participant’s trial outcome. We will not include your name or image, at your request. To apply for the trial, click here to complete and scan the attached application form and return it to calmarenj@gmail.com or fax to (201) 933-8159. Joe arrived from New York State two weeks ago, using a cane for mobility. His pain level was 8/9 due to a four-year battle with CRPS, after an injury in the workplace. He tried countless medications and pain management treatments over the years, which were not successful. His therapy options, other than increasingly strong opioids, were limited. She began to research alternative medicine options and discovered Calmare Therapy, a drug-free, painless solution to combat chronic nerve pain, particularly nerve pain conditions like RSD / CRPS. Dr. Michael Cooney specializes in using Calmare scrambler therapy to combat CRPS. Weeks later, Joe arrived at our clinic in New Jersey, feeling equal amounts of hope and skepticism, fearing he would be disappointed again, going home in the same level of pain. After the first week, his pain level fell to a 4/5. When he arrived for his sixth session, Joe was no longer using his cane. By the conclusion of his tenth and final treatment, his pain level was reduced further to 3/4, and he was no longer using prescription pain medications. 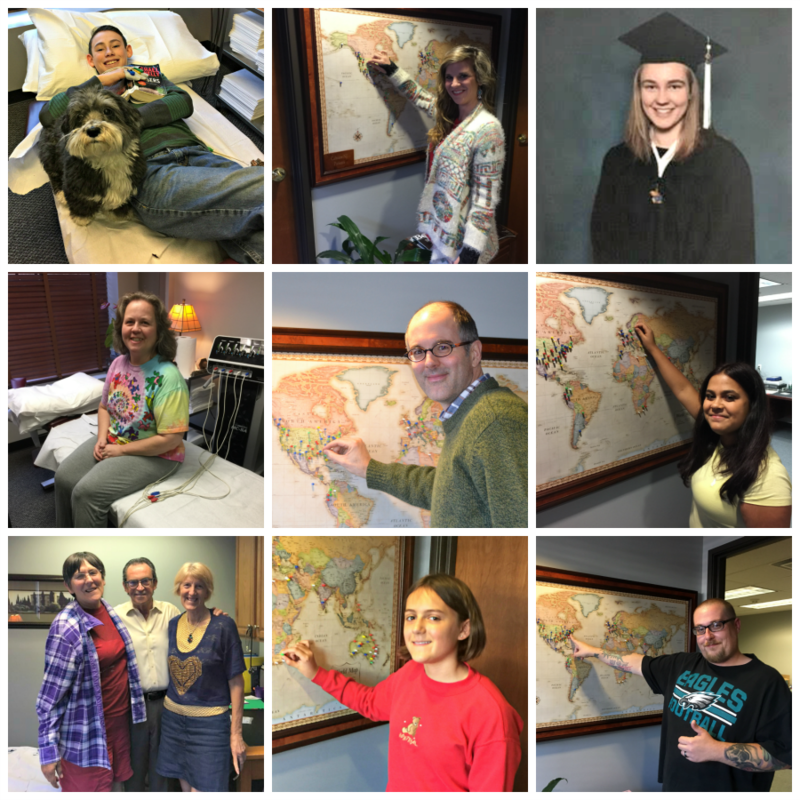 John adds his pin to the Calmare global patient map after his successful pain therapy. “I wanted to share Joe’s story because he represents some of our patients who do not leave pain-free, but their pain has been significantly reduced, and they are no longer using canes, wheelchairs and other devices to support mobility,” says Dr. Michael Cooney, clinical director at Calmare Therapy NJ USA. But if you suffer from neuropathy, you can certainly appreciate the vast quality-of-life improvement managing a pain level of ¾ versus 8/9. When you consult with Dr. Cooney and his team of scrambler therapy professionals, he will explain the variables that will play a role in your eventual outcome. That’s right, you will be speaking with our clinical director personally about your medical history. Why? “Calmare is not right for every patient,” says Dr. Cooney. Fill out and click ‘send’ on the ecard below, call the Calmare NJ USA clinic at (201) 933-4440 or email us privately at calmarenj@gmail.com. We’ll respond to your message within 48 hours. Until then, wishing you and your loved ones a low-pain day. At Calmare Therapy NJ USA, your scrambler therapy protocol includes more than pre-treatment consultations, multiple therapy sessions — performed only by clinical director Dr. Michael Cooney — and monitored follow-up care. “But what do cells have to do with my chronic pain?” you may ask. Examining your cellular structure gives us (your treatment provider) a precise diagnostic measurement of the health of your cells and the overall nervous system. Neuropathies (chronic nerve pain) can be a direct result of deficiencies in the Omega 3’s that ultimately results in an inflammatory process (inflammation), which can lead to a prolonged pain cycle referred to as chronic pain or neuropathy. We are excited to introduce BrainSpan™’s new and non-invasive diagnostic tools as a valuable partner with our FDA-cleared Calmare scrambler therapy treatment protocol. Have Opioids and Other Pain Management Options Failed to Reduce Your Pain? We can understand your frustration. Rest assured, nearly all of the patients we treat have already tried every conventional pain management therapy. Please look around our website, watch and read stories about our patients and then reach out to us at (201)-933-4440 if you’d like to determine if this treatment is right for you. On Monday, we were honored to welcome Victoria Abbott-Fleming, the founder of Burning Nights – CRPS Support, a UK-headquartered CRPS advocacy and support organization for sufferers worldwide, and her husband Michael to our clinic. Victoria, a CRPS sufferer herself since 2003, had a sample scrambler therapy treatment and we enjoyed a great talk. One of our CRPS patients from Alabama was in town for booster treatments. She was delighted to meet Victoria, whom she follows on social media. (Dr. Kuppusami Timakkondu, also a Calmare provider) and other doctors who have visited the clinic to learn, train and share their expertise on drug-free pain management alternatives, like Calmare Therapy. In conjunction with helping our patients from around the world, these alternative healthcare providers inspire me to do more, work harder and forge more powerful relationships that will ultimately benefit patient care. Together, we will resolve neuropathy–without reliance on opioids or invasive procedures– and help return people in pain to the healthy and fulfilling lives they so richly deserve. Since we introduced Calmare Therapy in 2011, we have helped older people reduce or even eliminate their neuropathic pain, after a myriad of prescription pain medications and other traditional therapies failed. Recently, Bernice Goldman made the trip up from Florida with her daughter, who discovered Dr. Cooney’s success using scrambler therapy through online research. Mrs. Goldman is one of several seniors who reaped the rewards of FDA-cleared Calmare Therapy, which is a painless treatment with no side effects. “Peter’s Foot” is available on Amazon.com. Click on the image to go to Amazon. “For the past two and a half years I’ve been suffering from severe CIPN in my feet, after undergoing Taxol therapy for breast cancer. Three months after finishing the chemo, the neuropathy got much worse. Since then I’ve been on a high dose of pain medication (Gabapentin, Venlafaxine, Tramadol). Still, my pain kept being at a level between 5 to 10. I also tried morphine patches, two painful and unsuccessful nerve blocks, cortisone injections, acupuncture, tens treatments and vitamin B12 shots. Nothing helped. My doctors told me that my CIPN was chronic and not much else could be done about it. Meanwhile, I kept researching options and read about the clinical trials for CIPN with “Calmare Therapy” at the Massey Cancer Center, as well as at the University of Wisconsin (UW) Carbone Center. The doctors at both institutions told me that they experienced positive outcomes. I was also able to talk to a patient who underwent Calmare treatment, which was encouraging. Then in the fall of 2011, I learned that the U.S. Military opened several Calmare centers. Read Nelia’s full story and treatment outcome here. Do You or an Older Loved One Suffer from Treatment-Resistant Chronic Pain? We invite you to reach out to talk one-on-one about you or your loved one’s medical history and pain management goals. Complete the info card below or call our respectful and friendly Calmare team at (201) 933-4440 between 10 am and 6 pm EST. You can also email us at CalmareNJ@gmail.com, where our clinical director, Dr. Michael Cooney, will respond to your message personally within 48 hours. I have been treating people in pain for more than 30 years. Providing successful pain relief for fibromyalgia sufferers has been especially challenging because many, if not most, therapies are often unsuccessful. In the worst case scenario, you could be worse. 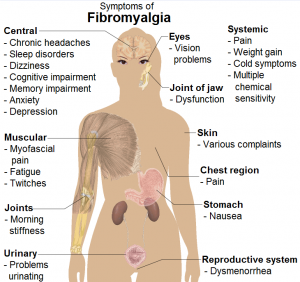 As a result, people with fibromyalgia syndrome (FMS) are dependent on pain medications for relief, which can introduce its own set of problems and ongoing expenses. The chronic nature of fibromyalgia symptoms interferes with job performance and attendance, personal relationships and ultimately dampens the overall quality of life. Women are ten times more likely to develop fibromyalgia. 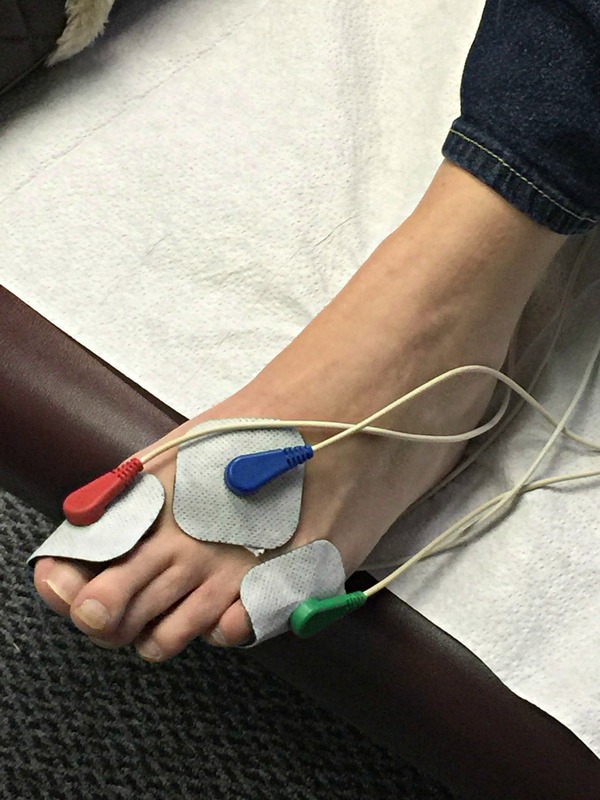 FDA-cleared Calmare scrambler therapy uses a drug-free, non-invasive, biophysical scrambler therapy to transmit a “no pain” message from the brain to the area in pain using electrodes similar to what you might use for an EKG. After treating more than 1,000 patients since 2011, we’ve experienced an overall success rate of 80 percent, which includes people living with fibromyalgia. What does “success rate” mean? In order to be considered part of our 80% success rate, the patient is required to achieve an outcome that reflects a very significant decrease in pain which is sustained for an increasing period of time after each treatment. In several cases, patients leave treatment at a 0/10 on the traditional pain scale. But let me be clear─Calmare is not a “one-time-only” miracle cure. Our FDA-cleared therapy is administered during a 10-treatment series, each lasting about an hour, which includes preparation, treatment and recovery. 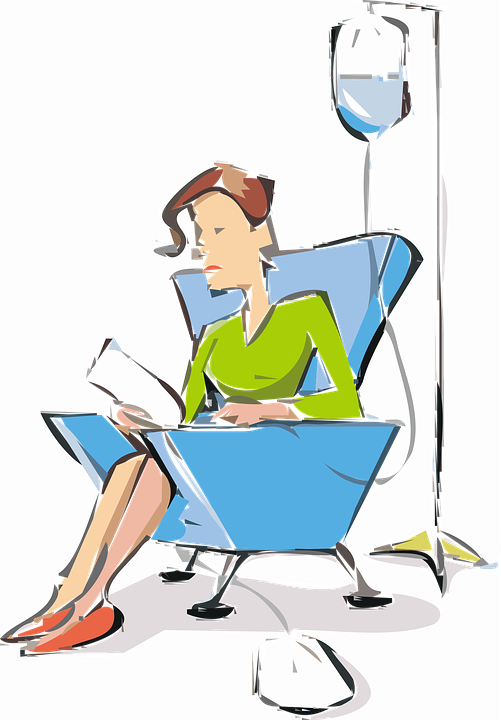 In nearly all cases, the patient experiences no pain or discomfort during or after therapy. Research and confirm your therapy is performed by a doctor who has advanced expertise in understanding the musculoskeletal system and how pain is communicated between the brain and the receptors in the body. Ensure they have successfully treated several patients with your specific condition. If your therapy is performed by someone with less expertise, your results may be diminished. Also, there are currently only seven providers in the U.S. who have been certified to perform Calmare Therapy, including myself. If you’re a fibromyalgia sufferer, don’t give up the fight to find a cure for your pain. Ask about our exclusive Patient-to-Patient Program where we will put you directly in touch with a patient who has already completed the therapy. I am always available to answer any questions or talk about your particular healthcare situation. Feel free to contact me anytime. Michael Cooney is a doctor of chiropractic at Rutherford Allied Medical Group in Bergen County, New Jersey. He is one of only seven (2018) Certified Calmare Therapy providers in the U.S. The FDA-cleared MC-5A scrambler therapy device has proven to be successful in the treatment of neuropathy (nerve pain) as a result of injury, RSD, fibromyalgia, radiating pain, cancer and chemotherapy treatment, PHN, diabetic pain, back and neck pain, post surgical pain, failed back surgery syndrome, and general neuropathy.